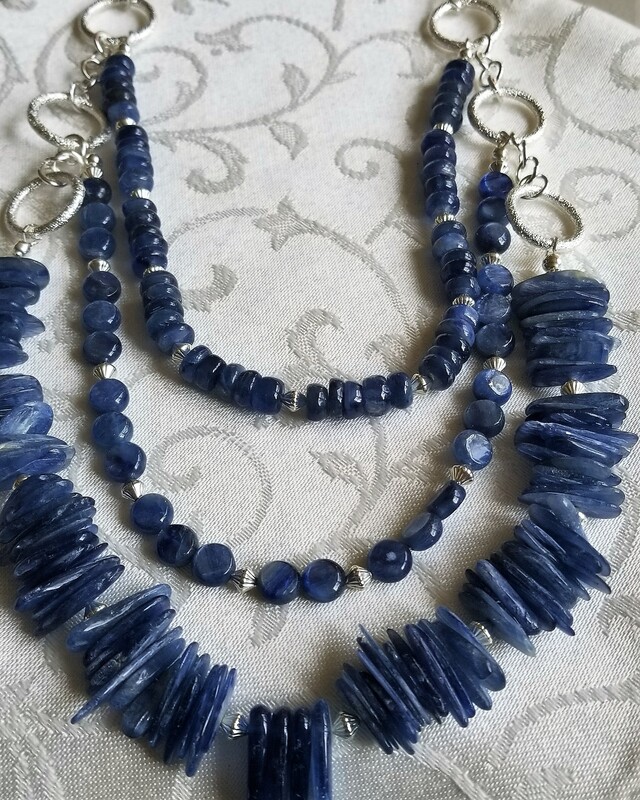 Blue Skies is a 3 strand of natural Blue Kyanite necklace, it has stick beads, coin beads, and abacus beads. The longest strand is 30". The chain and circles are all sterling silver. BONUS matching earrings. Kyanite is a cleaner and clearer of negativity, it will work hard to remove blockages in your personal energy field. When worn for a week or two it can make a significant difference to the negative baggage you carry around, cutting away the debris. It is is perfect for meditation. It is said to stimulate psychic abilities and the intuition. With its ability to tune into high vibrations this crystal helps connect to spirit guides. It facilitates dream recall and promotes healing dreams. When you are visiting a needy/depressed/sad or negative friend this is the stone to wear to keep your energy clean, and their energy out. kyanite can bring a rush of energy, motivation, inspiration, and even brilliance. Although it does requires certain openness and is better not used by more stuck personalities who are devoted to controlled ways of life. Kyanite is said to be helpful for those making the transition through death as it connects you to the higher part of your being and softens fear of the unknown. As it does not hold negativity, it never requires cleaning. Although as I always say I think they really appreciate being rinsed under clear water from time to time to freshen them up. Kyanite encourages speaking one’s truth, cutting through fears and blockages. It is said it also increases the capacity for logical and linear thought.